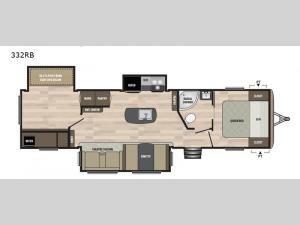 Your kiddos are going to love their own space in this Keystone Springdale 332RB travel trailer! There is a bunkhouse in the rear with a sofa and beds, giving your kids a place of their own to play. Choose from a few places for relaxing, eating your meals, or just enjoying one another's company. There is theatre seating and a booth dinette. The dinette can also be used for an extra sleeping space at night if needed. The cook of the group will love having extra counter and storage space with the kitchen island for cooking all of the family favorites. After a long day of adventuring, you will have the private front bedroom with a queen bed for a good night's rest.